copyrightsuisse.com provides by this certificate a proof linking the author - depositor, the creative work and the certain date of its existence at this point in time. The depositor recognizes that the contents deposited are its exclusive intellectual property. 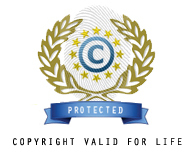 copyrightsuisse.com uses international protocols and international copyright conventions to ensure to creative works anteriority for Copyright protection against copy, counterfeiting or any right infringement. Copyright 2001-2019 copyrightsuisse.com. All rights reserved. - Sale terms - Legal Policy.